Queen Anne came to the throne on the 8th of March 1702, following the death of King William III. She ruled England, Scotland and Ireland until her death on the 1st of August 1714 when she was succeeded by George I. We are pleased to offer a range of fine antique sterling silver from the Queen Anne Period. All of our Queen Anne silver can be purchased online, or from our shop in The London Silver Vaults. During Queen Anne's reign England and Scotland combined for the first time into a single kingdom, making Anne the first ever sovereign of the Kingdom of Great Britain. 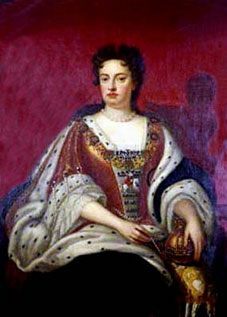 On Anne's death, she was succeeded by a second-cousin, George I, of the House of Hanover, ending 104 years of English rule and an impressive 336 years of Scottish rule by the House of Stuart. Throughout the Queen Anne period the required standard for silverware was the Britannia Standard which is slightly purer and softer than the sterling standard. The softer metal and the increasing influence of Huguenot refugees saw the earlier taste for flamboyant Baroque silverware give way to simpler, often cast forms with simple chasing and little or no applied decoration.